Resin cable joints are suitable for connecting and jointing plastic (XLPE) and paper insulated (PILC) low voltage cables (600/1000 volts) in straight, transition, branch and pot-end cable arrangement. All cable joints are supplied in kit form including joint shell, resin packs, connectors (crimp or mechanical option) and armour continuity system for steel wire armoured/braided cables. 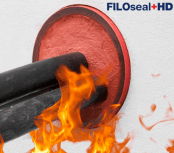 Duct sealing and sealing products manufactured by Filoform are installed to provide gas tight and watertight sealing for cable duct entries – protecting underground cables and substation ducting infrastructure against flood and migration of flammable and toxic gas hazards. Fire resistant version also available – suitable for sealing LV-HV power, telecoms and fibre optic cables. Filoform manufacture and supply quality products and solutions to connect, seal and protect low, medium and high voltage underground cable networks. Resin Cable Joints – jointing and connecting LV cables using resin filled joint moulds to provide electrical insulation and mechanical protection of cables for underground, submerged or location on cable containment. Thorne & Derrick provide competitive prices and fast delivery from stock for the complete range of Filoform cable joints.